The requirements for drainage in Massachusetts limit the materials a commercial or residential consumer can introduce to the stormwater system. You may not dump any solid waste, construction debris, paint or painting products, antifreeze, hazardous waste, oil, gasoline, grease and all other automotive and petroleum products, solvents and degreasers, drain cleaners, commercial and household cleaners, soap, detergent, ammonia, food and food waste, grass or yard waste, leaves, animal feces, dirt, sand, gravel, or other pollutant. If you are building a drainage system that will connect to the storm water system in any way you must apply for a permit. There are some very standard methods and techniques that you can take advantage – they all involve conveying water away from your house in a controlled manner. Whether that is through perimeter drainage pipes that collect runoff water and put it into the storm water system, or the more ecologically friendly method of slowing down the release of the water back into the ground – if you aren’t controlling how water moves around your house, you probably need to take a closer look at what’s actually happening. The simple graphic below and descriptions identify and explain the different methods for controlling water runoff. 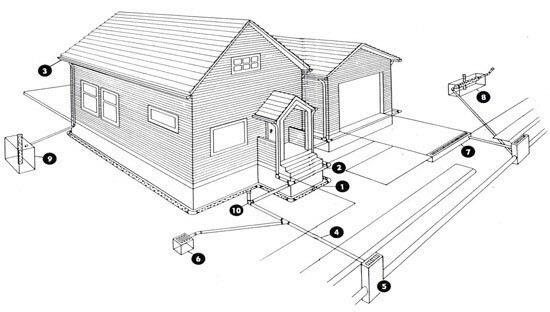 Foundation drains divert stormwater away from your building’s foundation. Foundation drainpipes are perforated and usually surrounded by gravel. The pipes disperse the water (instead of discharging in a concentrated area) and the gravel contributes to infiltration of the water. The gravel can be wrapped with a layer of filter fabric to prevent the drain from clogging with sediment. Roof drainpipes are not perforated, and are not connected to the foundation drain system. They should be connected to convey water to the City’s storm drain system, to a drywell, or directly to a waterbody. Gutters collect runoff from a building’s roof. This runoff is conveyed through downspouts to the roof drain system. Gutters should be kept clear of leaves and other debris so clogging does not occur in the roof drain system. Storm drainpipes convey rainwater to the City’s stormwater system. Storm drainpipes can be made from many different materials such as concrete, aluminum, and polyvinyl chloride (PVC). Catch basins are connected to storm drainpipes. They are concrete structures (either round or rectangular) with metal grates on top. Catch basins capture debris that could clog the pipes in a storm drain system. You can prevent the system from clogging by checking the catch basins in your neighborhood during and after a heavy storm. Use a broom or rake to remove any leaves or debris that have blocked the catch basin’s grate. Yard inlets are similar to catch basins but are much smaller. Metal and plastic yard inlets can be purchased at a local hardware store. Trench drains are used to capture stormwater flowing over a larger area like a driveway. Trench drains convey rainwater to the City’s storm drain system. French drains can be installed anywhere on your property that collects water. French drains are constructed with a perforated pipe. Gravel and filter fabric surrounds the pipe, similar to foundation drain systems. Drywells can be installed in areas that cannot be connected to a stormwater drainage system. Drywells are filled with gravel and surrounded by filter fabric. Water flows into the wells and infiltrates into the ground through the gravel. Cleanouts are designed as easy access points for maintenance of the stormwater drainage system. They are usually located in a bend where debris can clog the system. One option that is not discussed in the above graphic and is often over looked when it comes to addressing drainage and water runoff is permeable paver systems. These systems are designed using concrete pavers and a specially designed base of stone to filter water down from the surface into the ground. These systems essentially eliminate run off into storm water collection points and are the perfect solution if your property has too much impermeable space. All of the above designs and rules apply to commercial properties. Depending on the use of your commercial space and parking area, you may have to deal with treatment before materials reach the stormwater system. Contact Sheridan Landscaping for a free estimate on our commercial or residential drainage services at (774) 413-5012 or fill our contact form to get immediate assistance.